White paper on crime 2001 Part3/Chap.2/Sec.3/1. Fig. III-22 shows the trends in the number of persons newly admitted to juvenile classification homes since 1949. 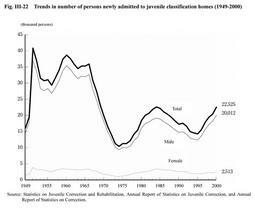 The number of newly admitted juveniles showed a downward trend from 1985 until1995, only to turn upwards in 1996. In 2000, it increased by 2,143 (10.5%) from the previous year, reaching 22,525. This number is close to the standard in 1984,which is the peak of the number of persons newly admitted to juvenile classification homes during the period as the 3rd wave of juvenile delinquency in postwar years (see Appendix III-11 ). Fig. III-23 shows the percent distribution of each type of delinquency in juveniles newly admitted through adjudication for protective detention in 2000, by gender and age group. 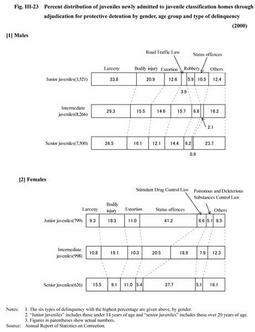 The distribution of larceny is highest for delinquent males in every age group, followed by bodily injury and extortion for junior juveniles, Road Traffic Law violations and bodily injury for intermediate juveniles, with similar percentage, and bodily injury and Road Traffic Law violations for senior juveniles. As regards delinquent females, status offenses had the greatest share for junior juveniles, followed by bodily injury and extortion. For intermediate juveniles, status offenses, bodily injury, and Stimulant Drug Control Law violations had about 20% of the share, respectively, followed by larceny and extortion with about 10%, respectively. As for senior juveniles, the percentage of Stimulant Drug Control Law violations were highest, followed by larceny, extortion, and bodily injury. Table III-4 shows the number of persons discharged from juvenile classification homes in the past three years, by reason. In 2000, probation was the most common reason for discharge from juvenile classification homes (45.1%), followed by commitment to a juvenile training school (26.9%), tentative supervision (11.6%), and cancellation of protective detention (8.1%).